When I was a child in the 1970’s, you couldn’t watch a television show without seeing Paul Williams. Whether he was guest starring on an episode of ‘The Brady Bunch’ or ‘The Love Boat’, or showing up on The Mike Douglas Show – he was one of the most multi-talented and ubiquitous performers alive. He was even a heart throb. He made Marsha Brady woozy. He was also a songwriter who crafted some of the most successful songs of the decade: “Rainy Days and Mondays”, “We’ve Only Just Begun”, “Evergreen” and “The Rainbow Connection” from the classic “Muppet Movie” of the early 1980’s. Mr. Williams faded from view for years, likely resting from the drink and the cocaine binges so prevalent at the time. When the documentary “Still Alive”, written and directed by Stephen Kessler, came onto the scene a few years ago, I was basically giving him up for dead. The film corrected me. I’ve been watching and re-watching this documentary on Netflix. (As you can see, I’m going though another bought of documentary obsession lately, having mentioned “Good Ol Freda” last week.) 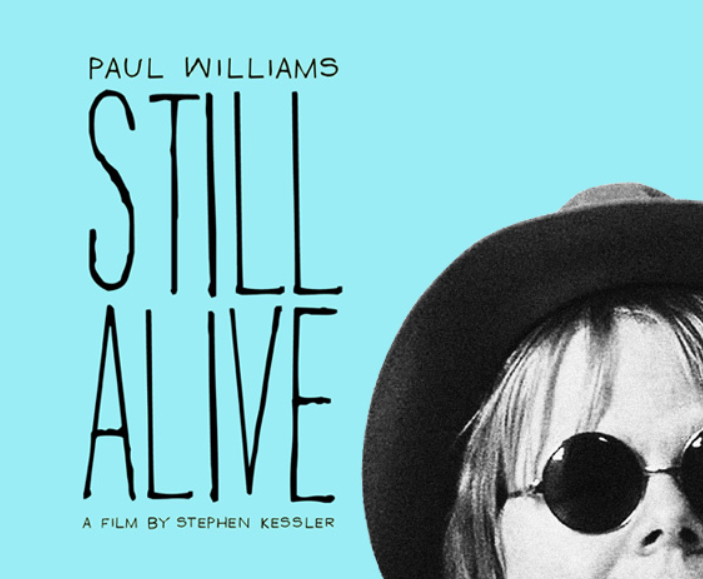 “Still Alive” shows Paul Williams in his recovery glory. He’s a man who lives in the moment, living with grace and gratitude for all his good fortune and clarity. He makes Kessler, his side kick documentarian, look like a nervous Woody Allen. As a Paul Williams fan back in the day, Kessler is constantly self conscious about how Paul perceives him. Things get weird and tense when the camera is pointed at Williams during quiet moments. They initially bond over their love of squid dishes, like Calamari and…well…Calamari. However, their bro-hood is sealed when a stressful trip to the Philippines – fraught with Kessler’s concerns of Al Quada living the jungle – turns into a nice experience. Paul Williams took all warnings in stride, never letting travel advisories get in the way – always thinking positive and never assuming the worst in people. Paul Williams could care less about adversity. It shows in this documentary. He’s been through the ringer of his inner demons, and he approaches possible challenges like they’re nothing compared to the problems he left behind. Williams always seemed fearless, even in his drug addled days. The fact he has skydived on television, and loved it so much he did it again on his own – speaks volumes. When you view the film, you realize it wasn’t drugs that gave him strength. He has enough of it on his own. To me, he looks better than ever. At 74 years old, he’s trim, affable, and maintains the sparkle that started to fade in the 80’s when the drink and the drugs began to show on his face and his behavior. He disappeared. He found sobriety. He helped raise his kids and he kept the musical home fires burning. Behind the scenes, he’s emerged as celebrated businessman, having been a member of the ASCAP Board of Directors, and then officially voted in as President in 2007. He even went on to win a Grammy for his work on Daft Punk’s album “Random Access”. Not too shabby for the shaggy haired jack of all trades. Paul Williams is a legend, although he may not want to hear it anymore. His big time Hollywood days of appearing on Johnny Carson’s show, or the Hollywood Squares may be over. He may play small venues in Vegas and lay low compared to his days on the big stage. But he’s found an even bigger form of success. Happiness. I highly recommend “Still Alive”. 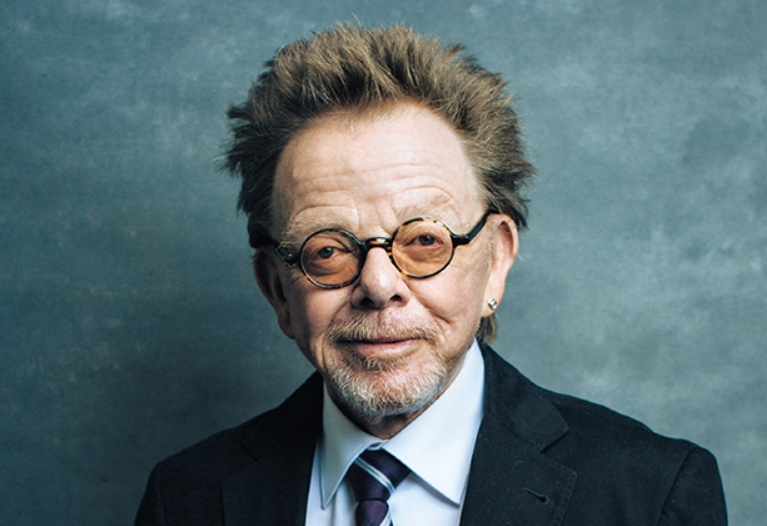 If you remember Paul Williams, you will find a deep admiration for him. If you are too young to have known him, you’ll know him now. Categories: Monday's Weekend Suitcase | Tags: ASCAP, Documentaries, Paul Williams, Songwriters, Stephen Kessler | Permalink. It’s Monday and I need a diversion. This is a lyric set to the tune of Bob Dylan’s “It Takes a Lot to Laugh, It Takes a Train to Cry.” Because I need a hound fix and I’m becoming a ridiculous dog person. ..around for treats but I get nil. 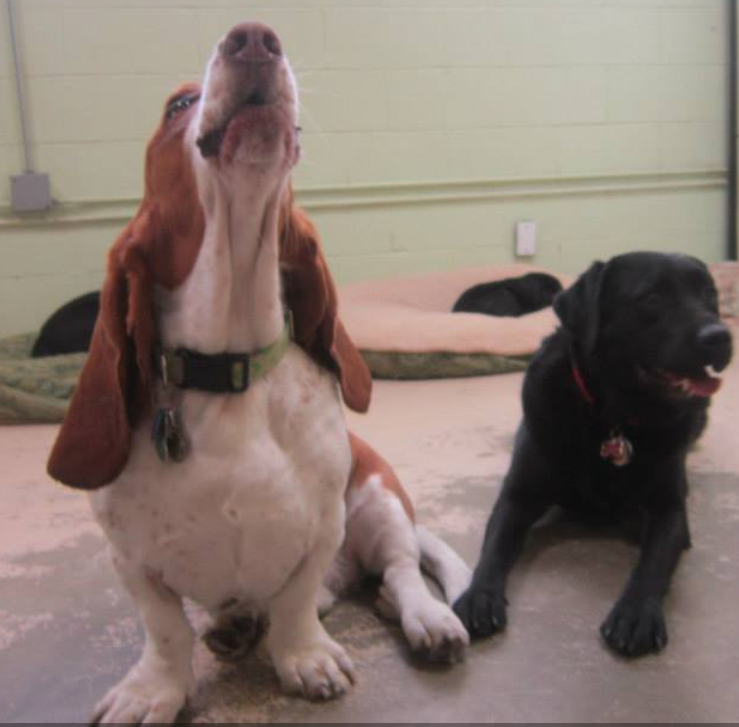 Oh, if I howl like a bluesy hound shill…. Maybe she’ll come home, and hug me ‘til I’m chill. My belly needs a scrub. The television’s on, but I do not give a blub. Awww, come home now, momma, come home and give me a tummy rub. Think I’ll jump on the couch. alone watching “The View” ain’t much. If I die while viewing “The Chew”…. Categories: Monday's Weekend Suitcase | Tags: Basset Hounds, Bob Dylan, Lyrics, Songs | Permalink. I’m on a Target High! Hello readers of “The Write”! It’s the end of another Monday. I’m still working on the finishing touches of “Hitting Water” which feels like it will be birthed next week, but I can’t say just yet. This detail is up to Amazon and Createspace and all the wonderful people who work tirelessly on my behalf to get these books out for do it yourselfers like moi. But, I’m just checking in because I’m still on a high from shopping at Target on Saturday morning. Yes – it’s been over 48 hours since I ventured out to the “Big Red Bullseye” or “Targee” as they pronounce it in hoity toity fashion, but I’m still floating. 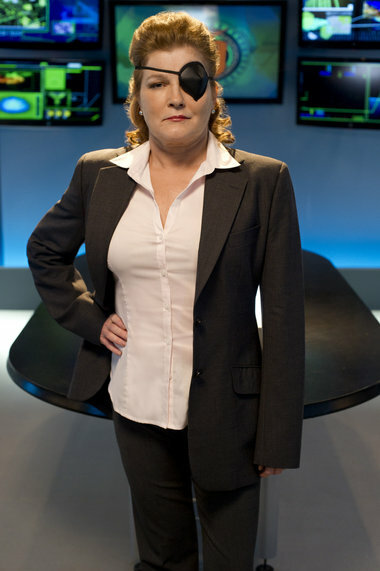 And may I just say – this is not an advertisement. Not at all. 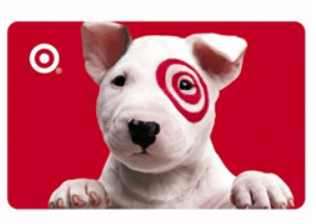 I wish I had a sponsor in Target, but I don’t. I haven’t stepped foot in Target since I lived in New York in 2010. I don’t know why I haven’t. It’s likely due to the parking situation here in LA. I haven’t been to a Whole Foods in two years for the same reason. You just can’t find a parking space. It’s nuts. But since I’m was in the market for a new vacuum cleaner and a Crock Pot, I was determined. I got out early on Saturday, and set my sails for the nearest store. The nearest Target is 2 miles away, in a shopping center known as The Beverly Connection, across from a mall known as The Beverly Center. I turned into the parking lot, drove up the ramp to the level Target lives, and was slapped across the face with the gorgeous sight of a sea of empty parking spaces. I happily parked my Prius C next to the entrance to the store. Yes, it was open. Yes, it was huge, roomy, clean and full of bargains. I was back baby. Not since I lived at City Center in White Plains, where my apartment building was above a shopping mall, and a branch of Target was my basement, had I felt this wonderment. I was a child in a candy store, ready to buy bargain workout clothes, boots and appliances I had longed for. Just the shopping cart alone was a pleasure, in it’s heavy corded red plastic. The wheels were shock absorbed, floating on air ready to hold the spoils of my hunt. Man, I needed hosiery. Knee highs and tights – I’ve let it go too long, wearing socks with holes in the toe or agonizing over uncomfortable stockings where the crotch ends up near your knees after walking 10 feet. Done. Good price. Hosiery – I’ve got you covered. Then, I needed a nice pair of three inch heeled booties for my bootleg dress yoga style pants. This is now my staple. Middle age and hormones, exacerbated by the loss of an ovary last year, has made it uncomfortable for me to wear jeans. So, I starve and work out and live luxuriously in these form fitting comfy bootleg pants in different colors that desperately need a nice heel and toe to complete the look. The three inch booties I’ve worn since 2007 (yes, I wear stuff to death) were ripped, pulled, stretch and done. Whatever will replace them? Boom! Over in the shoe department, a nice set of cute black suede boots will do the trick. Forty bucks. Better than the $119 boots I saw at Zappos. Come, little booties. Come join the knee highs, tights and the new workout top in my lovely, quiet and cozy red shopping cart! But enough with all these distractions. Time to get what I came for – a Crock Pot – to make all those yummy meals while I’m at work. Easy enough – they were right there in kitchen appliance aisle. Twenty bucks for a nice pot that will fit in my cabinets. Done! And now, the final piece to the puzzle. I needed a vacuum cleaner. Badly. The one I had used to be amazing, sucking up dog hair like crazy. But in the three years I’ve used it, I realized that it’s heavy, cumbersome and giving off a horrible puke smell. Why? I don’t know. Over to the vacuum and cleaning aisle. And there I saw it…the king of all vacuums. The stylish and highly coveted Dyson. La Creme de la Creme. I’ve avoided it for years. It’s so expensive. Is it worth paying so much for something that involves cleaning? Well, the smell of puke emulating from my old Bissell said – YES! I didn’t get a deal on this. I missed the Black Friday sales. I paid the usual price. But – when I brought it home and used it, the whole picture became a revelation. Floors were immaculate. Carpets were fully cleansed. The lightness of the appliance and the ball technology help mold the vacuum to every surface and difference in height between floor and rug. I haven’t seen my place look so great since the day I moved in and unpacked. So, although I have a book coming out, and am thrilled – I’m also riding a Target High. Happy for the goodies I got and the good use to come. Now, I have to get a DropCam to monitor my dog while I’m out at the office – and then I’m good! And then a new digital piano. And a trip to San Francisco for Comedy Sketch Fest. Okay, and then I’m good. Categories: Monday's Weekend Suitcase | Tags: Holiday Shopping, Target | Permalink. 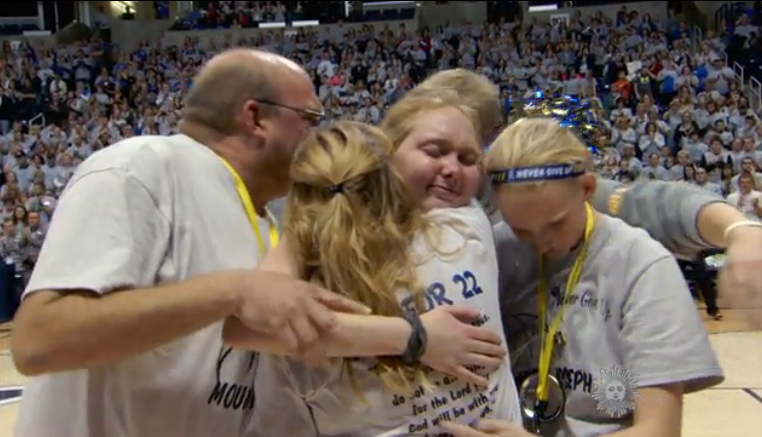 Lauren Hill and her team after a big win. There was a tear jerking segment on yesterday’s CBS Sunday Morning reported by human-interest journalist Steve Hartman. It was part of an ongoing update on the latest news of Mt. St. Joseph University freshman Lauren Hill. Lauren is a star basketball player who has terminal brain cancer. She has not missed a practice or game, despite her worsening condition – determined to play until it’s absolutely impossible. Last week, when she placed the winning shot against The Hiram Tigers, something amazing happened: The losing team cheered. 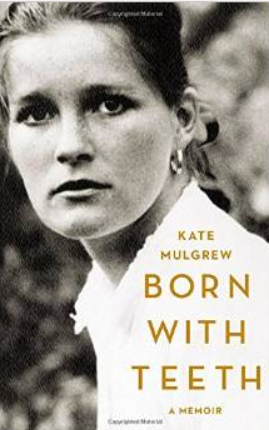 It’s quite a beautiful story about a wonderful young lady, and how those who lose gracefully can be the biggest winners of all. It got me thinking about my days in school, when I competed in high school track and cross country. I wasn’t a great runner, but I was addicted to my daily runs around town and on our school track – an addiction that would last decades, until age and injury slowed it down. The terror of the starting line made my adrenaline crackle. The run itself was a thrill. Crossing the line was euphoric. The only thing was – when I crossed the finish line – I always…despite showing up each day for practice and running miles on weekends…always came in last. Sometimes so last, people would have to wait until I finished. I was in great shape. I had a decent pace and gait. I was trim. But I did not have a light runner’s body, and sprite muscles. Despite all that work…. last. Did it bother me? Yes. Sometimes I’d finish with tears in my eyes. Did it deter me? Never. Just finishing made me feel great in some profound way. But, it’s difficult to put so much work into something you love, only to have nothing to show for your team. Me! 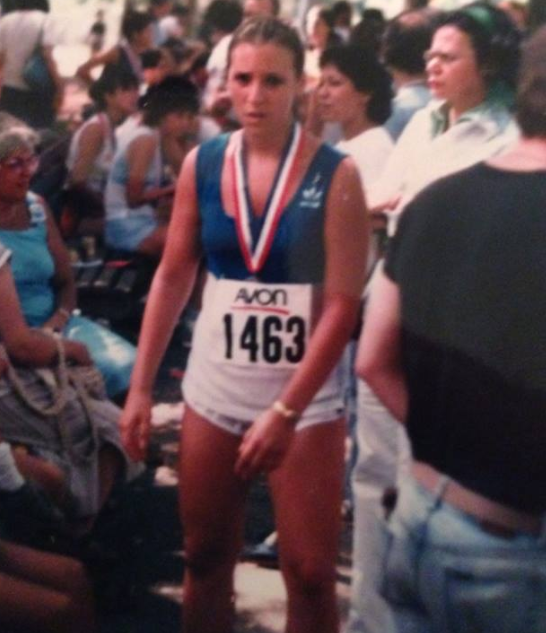 Finishing the Avon 1/2 Marathon, Central Park, NYC – August 1981. I used to run the 880 yard dash and the 2 Mile relay in spring track. Despite earning “Most Improved” on winter track a few months before, I still lumbered in last during meets in spring. But there were some interesting lessons on winning and losing in between the frustration. Our girls spring track team was undefeated for the first month of meets. We embarked on a meet with our rivals, Eastchester High School, who were also undefeated. So, you can imagine – someone would lose that mantel by the end of the day. Well, it was us. We lost out to some really fast runners and a few strong field event girls whose size and girth could place a shot-put through your head. Our laughter made our Coach- Mr. Galanka – stand and address us. Uh oh. What did we do? Actually – we did good. He told us how proud he was of us. The fact that we were laughing and enjoying each other after a disappointing loss exemplified our strong character. He said that we should always remember this in life. And that as strong young woman, we should never define ourselves with superficial things like hair do’s and nails and clothes. That our character in the face of losing is what matters. What a guy. It was the most meaningful moment of my life – even today. Yet, Coach Galanka wasn’t done teaching lessons. A few weeks later, we were at home, running against an all girls parochial school – St. Ursula Academy – a team that was beating us on our own track. Galanka came to me to prep me for the 2 Mile Relay (which is an 880 yard dash for each of the 4 members of the relay team). Apparently, he wanted me to be 4th in the heat. If you know relays – usually the fastest person is 4th, because that’s the last runner who brings it all home in the final stretch. I though he was mad. Insane. “Because I know you can do it,” he assured me. “Yes we will – if you don’t finish this race for us. But I have faith that you can do this,” he said. I though he was crazy. This must be a joke. My heart was beating in my throat. I thought I was gonna hurl my pre-game Snicker’s bar, eaten ritually before a track meet. The race began. My fellow relay runners were KICKING IT! They worked up a very wide lead, and by the time it was my turn to grab the baton, Ursula was more than half a lap behind us. It didn’t quell my nerves, but I was ready for my leg as the baton was handed to me – literally. As I ran the first 440 yards, I gained on the Ursula Academy girl who was in the 3rd leg of their relay team – until I ended up passing her. (Remember, I’m in the 4th of mine). Oh my God… I lapped her! We were now one full lap ahead. I finished the relay – and we won as the Ursula team continued to run out their last lap minutes later. I’ll never forget him or that moment. Today, he’s an award winning assistant football coach and woman’s track coach at Fordham University in the Bronx, NY, where he leads young athletes to titles and championships. Lucky bastards. Yes, he’s one of those coaches – one of those teachers whom you never forget. They teach you lessons in life – like how to be a good loser – how to allow someone to see for themselves that hey can do anything, given the determination and love of the sport. Much like Lauren Hill and the ladies from the Hiram Tigers – it’s not the winning that’s important – it’s how you lose. Categories: Monday's Weekend Suitcase | Tags: CBS Sunday Morning, Coaches, Cross Country, Sports, Teachers, Track and Field | Permalink. My book “Hitting the Water” is finished. I can’t believe I’m even saying it. After writing the stories, editing, revising, and re-editing, it took all my strength to finally let it go. With all the nit picking of phrases, words, re-naming characters (to protect the innocent), and fine tuning the introduction and verbage of each entry, it’s a relief to see it through. The stories are mediations, dreamy vinettes about life and death. It was a book that I needed to get out in order to move on. Now, it’s done. Time to lighten up. So, what will be the next project? Ahhh…. 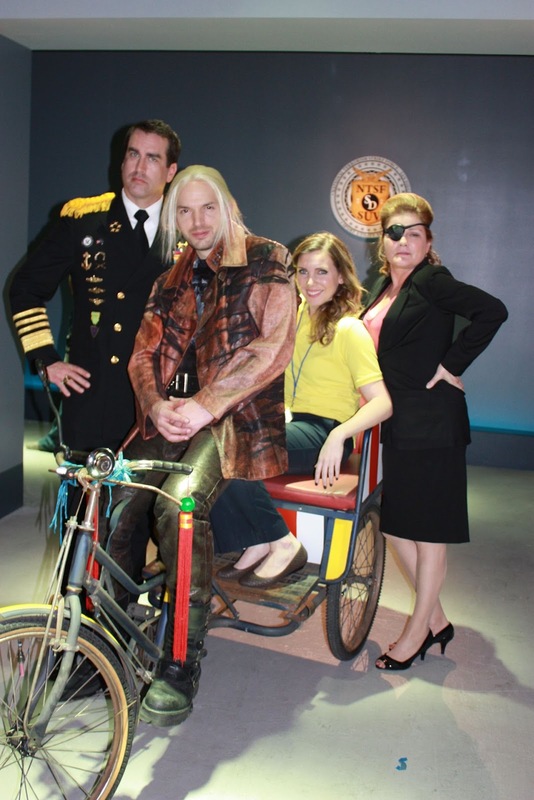 (as I rub my hands together with delight)….I’m going into the world of satirical SciFi. Think Douglas Adams and Terry Gilliam. Think “Brazil”, “Hitchhiker’s Guide to the Galaxy” or “Metropolis”. 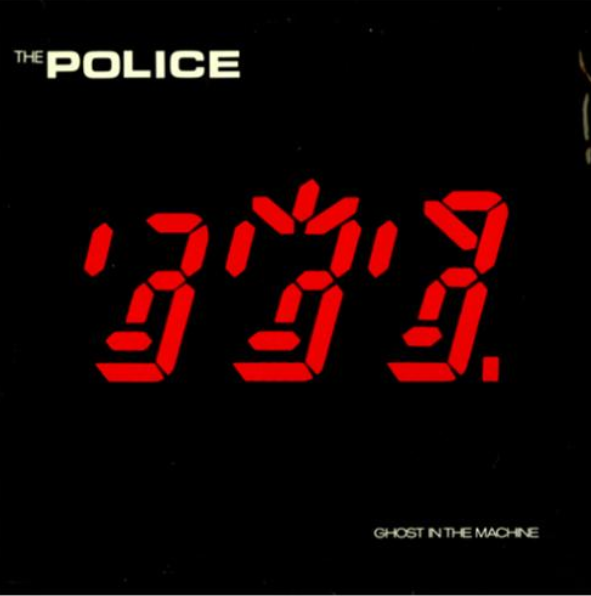 The vibe of the old Police album “Ghost in the Machine” is humming in my brain – providing the tone for this new work I began months ago before putting it aside to work on “Hitting Water”. I’m fascinated with the book “The Writer’s Journey: Mythological Structure for Writers” by Christopher Vogler. Joseph Campbell also covered this ground in “The Hero Has 1000 Faces”. Both books provide a fascinating pattern of archetypes that sew together the flow of a solid story. You feel the thread in one form or another in every movie you’ve ever seen. Grand stories like “The Wizard of Oz”, “The Hobbit”, “Harry Potter”, “Hitchhiker’s” or “Lord of the Rings” are built on this architecture. For the first time ever, I’ll be using the blueprints provided in these books to develop a story that takes place in a futurist world. This will be an uphill climb. But I love this feeling of being uncomfortable and pushing myself to do something new. Categories: Monday's Weekend Suitcase | Tags: Brazil, Douglas Adams, Dystopia, Hitchhiker's Guide to the Galaxy, Terry Gilliam | Permalink. Just your average, ordinary neighborhood, where lovely palatial homes with perfectly manicured lawns stretch out to a perfectly maintained sidewalk. If you’ve ever seen the film “Cheaper By the Dozen” with Bonnie Hunt and Steve Martin, this is the house where it was filmed. It’s a few blocks from where I live, and it seems to house a family that is just as boisterous and charismatic as the family in the movie. The kids are between thirteen and seven – all freckle faced and gregarious. Their driveway is parked up with all-terrain vehicles with back hatch bike racks and shiny BMW’s. Nice folks, too. And yes – apparently there is really a pig somewhere on the property. 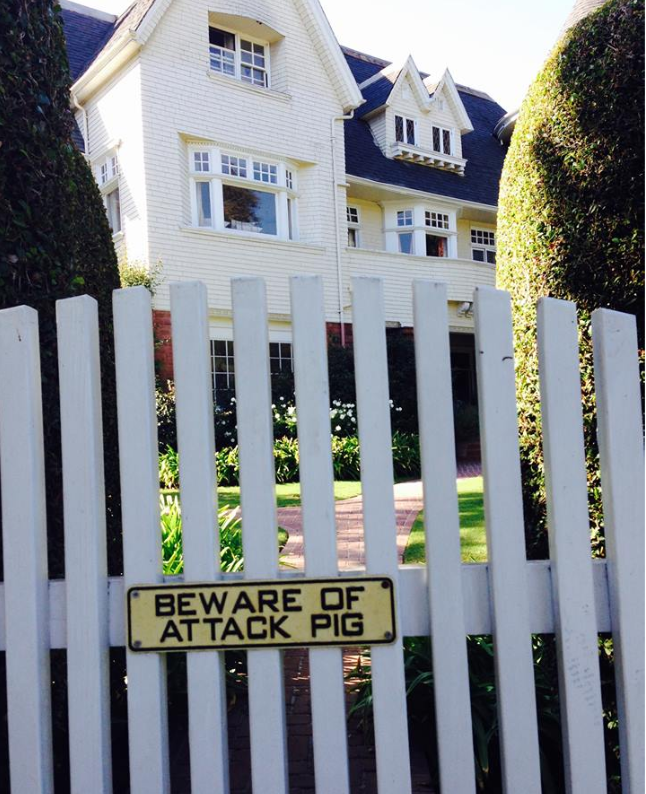 While walking by the white picket fence toward the back part of the house, you’ll hear the low guttural grunts of a porcine piggy. Or – so they say. I usually hear a dog, barking angrily at my hound who just whines and trots away in fear. And another thought… I was watching this clip from The Fisher King. It suddenly occurred to me that the progress in digital technology has rendered the old video store obsolete. Yes, I’m sure there are some video shops hanging onto the old school love of a video (that is – if anyone still has an operating VHS machine, and I’m sure there are folks who do). So, with the Blockbusters and Mom & Pop shops now turned into dry cleaners or a Whole Foods, what happens to the life-long card carrying members of that dusty old Video Shack? Is a life long membership applicable to the life of the member, or the life of the shop. Details. I bet it’s in the small print on the back of the card. Lovely scene. Beautiful movie. You didn’t think I could go a week without a Robin Williams moment, did you? Categories: Monday's Weekend Suitcase | Tags: Cheaper by the Dozen, The Fisher King | Permalink.